Bollywood makes and breaks stereotypes, makes and breaks fashion statements, and one of them is tattoos. Tattoos have now become a rage among the citizens of India as well. And some of the credit goes to Bollywood for it surpasses every other source of popularity and fame for any product or a new trend. Though the thought of having something inked on your body permanently sounds quite frightening and the pain one has to bear to get it done becomes another important reason to stay away from it, many still go on to get inked for it is also assumed to be “cool”. Not just this, but it also serves as an expression of what one connects the most with. 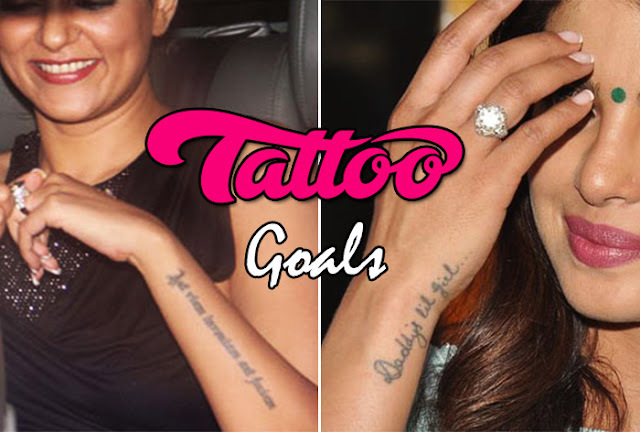 We are sure you must have come across many Bollywood celebrities’ tattoos but here we have found the most amazing tattoos that they wear on their skins. The reason that this man tops the list is because he unabashedly got the name of his beloved Kareena Kapoor tattooed on his left forearm without the consequences in the media. 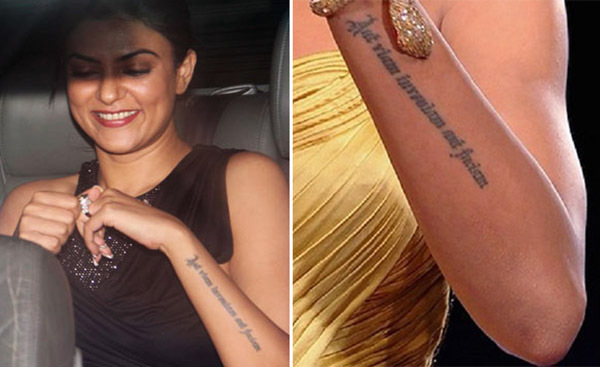 The tattoo reads ‘Kareena’ in Devanagari script and it is not some small font size which could be ignored, it is of reasonable size to be noticed. Beckham may have made it popular in the west but it was Saif who made it a trend here in the east. It created quite a buzz and many have begun to surprise their love interests or their spouses by getting their names inked as a token of their love. The International Bollywood star did not leave any opportunity to convey her love and respect for her father and her first tattoo was one of those. She has a tattoo which reads ‘Daddy’s Lil Girl’ on her right hand’s wrist which is dedicated to her father and what makes it special is not just the beautiful emoting words but the fact that she got it inked in her father’s handwriting. Tattoos on girls’ wrists can be seen since then in the country. Kangana Ranaut is a prominent stereotype breaker in the industry who has taken the world by storm from her unafraid and stout-hearted claims of being a tough horse of a long race. And her tattoo suggests nothing otherwise. 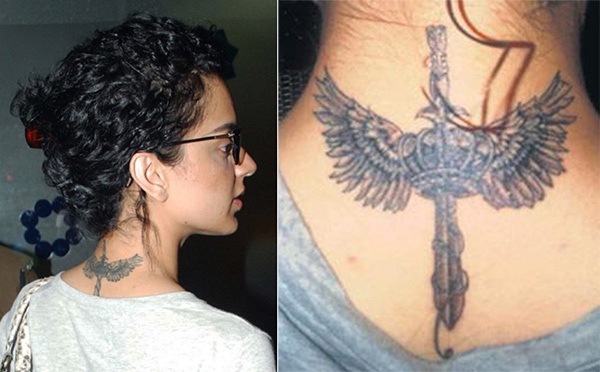 She has a beautiful tattoo of a winged crown and a sword in between on the nape of her neck. But what is surprising is that this tattoo is actually a covered up one. She actually got the original tattoo in her teenage days which was just the winged crown but she got it covered for better, for now, it looks fierce suiting her personality well. This most eligible bachelor in town makes way to the headlines mostly for his relationships and when we hear the words Ranbir Kapoor and tattoo together, we think of Deepika Padukone’s tattoo of her former boyfriend’s initials but the man has got a super cool tattoo himself. Though it is not sure whether it is a temporary or a permanent one, the word ‘Awaara’ was seen written on his wrist in Hindi which is also a title of an insanely popular film by his grandfather Raj Kapoor. Permanent or no, it was a really good idea of dedication. The Queen of sass – Sushmita has been an inspiration in every other way. The way she carries herself, the way she has built an exciting life for herself, the way she walks on the ramp, everything about her needs to be taken notice of, for it motivates one to become of value. Her various tattoos exhibit the same and one of the most favourites is on her right forearm which reads ‘Aut viam inveniam aut faciam’. It is a popular Latin phrase which translates to “I will find a way or make my own”. Her fans expect nothing less from her.